Today I had to cook spinach. It was way past its expiration date. Because today was Tamil new years day I had to prepare payasam and vadai. So ...guess what? 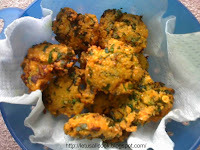 I made keerai vadai! how clever? (lol!). It is very good recipe and healthy too. Generally kids don't like eating spinach. But when you give them this spinach based recipe, they will adore you. Wash and soak the dals and rice in water for two to three hours. Clean, wash cut the spinach leaves . cut the ginger,garlic,green chillies and onion. Drain the dals and rice and coarsely grind them along with the ginger, green chillies and Hing powder. Make sure that you drain all of the water so that after you grind it will be easy for you to make it into vada shape and fry. Add the chopped spinach and salt to taste and mix well. Heat sufficient oil in a kadai. Make small balls of the prepared mixture , place it in your hand and press slightly so that it becomes flat and then deep-fry them until they are crisp and brown. Serve hot with a chutney of your choice or you can eat them without any side dish.